Are you searching for the perfect new flooring for your home remodeling project? Discover the perfect union of affordability and style by investing in tile flooring from our showroom. For years, our flooring experts have connected local families with high-end materials perfect for every room in their homes. Now, we're ready to assist you in your quest for the perfect low-maintenance, yet affordable flooring product. You have an unlimited selection of flooring at our reputable store. Come in to peruse our stunning collections of ceramic, porcelain, and slate tile. Our spacious showroom carries tile in a variety of patterns, colors, and sizes. Find the perfect tile floors for your home - from earthy slate tile to hardy ceramic tile, you're sure to find something that adds character and distinction to any room in your home. Tile is one of the most dynamic flooring options available through our flooring showroom. It can be used in high-traffic or wet areas in any room. For example, many of our clients use tile in the kitchens, bathrooms, laundry rooms, and sunrooms. However, it's important to choose the right kind of tile for your project. Depending on your goals for your home's safety and value, you may prefer traditional ceramic tile to high-end porcelain tile. What's the difference between these two materials? To begin with, standard ceramic and porcelain tiles consist of different materials. In ceramic tile, you'll find a good mix of red, yellow, and brown clay; on the other hand, porcelain utilizes mostly white clay during the manufacturing process. This gives it a purer color, as well as a sturdier surface. Our flooring experts recommend ceramic tile for homeowners concerned about their budgets. This standard tile flooring is excellent for use in busy households, as it resists scratches, stains, and other kinds of damage. However, if you're looking to invest in a flooring product that is a bit stronger, we recommend you make porcelain tile a permanent feature in your home. Along with ceramic and porcelain, our shop carries distinctive slate tile flooring options. Slate is a sophisticated, eye-catching choice for any home or business; not only that, it’s low maintenance. Cleaning is a breeze, and slate never requires regular refinishing like other flooring materials. And, like its ceramic and tile cousins, it’s long-lasting and can stand up to everyday wear and tear. Marble: Looking for a truly unique flooring material? Don’t forget about marble. Marble remains one of the most popular flooring options in the world, and it’s easy to see why. Each individual piece is unique – this is because marble is formed inside and cut directly from the earth. When you bring home marble flooring, you bring home a furnishing like no other. Foam: Protect little ones from hard knocks with foam flooring. Foam is a relatively new innovation in flooring, offering a characteristic springiness that other materials simply can’t match. It’s an excellent choice for rooms that see a good deal of accidents and tumbles, so our team recommends adding it in playrooms and gym rooms. Reach out to explore other potential applications. Cork: Soothe aching feet and reduce noise throughout your property with a set of cork floors. Cork is a recently popular flooring material, offering a softer-than-usual surface that is also quite warm. These traits make it popular with many of our clients, as cork delivers a restful and soothing experience that other materials simply cannot replicate. Plus, it comes in several dynamic styles and colors. Granite: If you thought that granite was reserved exclusively for countertops, think again. Granite is a popular flooring option for many residential and commercial clients, offering a convenient blend of durability and sophistication. Like marble, granite is available in many unique patterns. The one that’s right for you is waiting at our showroom, so stop by today. Travertine: You may not have heard of travertine until today, but chances are you’ve heard of limestone – and that’s just what travertine is. 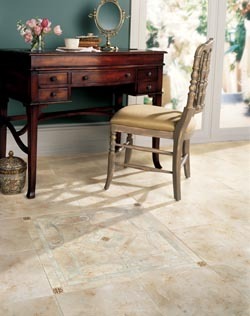 Molded by intense heat and pressure, travertine stone is truly paving the way for bold and rustic flooring materials. Add a touch of natural beauty to your space with this charming choice. Glass: For homeowners and businesses looking to make a splash, our flooring specialists recommend glass. Glass flooring has quickly gained popularity with shoppers throughout the country. Its dynamic appearance and easy-to-clean texture have made it a natural choice for creative projects, and it repels water, making it a great choice for bathrooms and kitchens. Tile is a unique, but finicky flooring material that requires a special touch during installation. Allowing an amateur to handle your latest investment could prove disastrous, as there's plenty that can go wrong. Don't compromise the value of your home - instead, recruit our tile flooring installation experts and rest easy knowing we have your reflooring project well in hand. Our contractors arrive at your home with all the equipment we need to lay your new tiles. Free in-home measurements are available; in fact, we encourage you to schedule an appointment before purchasing any tile flooring. Our team can help you purchase the correct amount needed for any room in your home - no more, no less. Be sure to let us know if you have any special requests for patterns or pictures. Tile is a versatile material, and depending on your ideas, our contractors can create original images using tiles of different colors and sizes. Additionally, you never have to worry about problems with your new tile flooring once the installation process is complete. Our contractors have complete confidence in their abilities. However, if you notice installation-related issues after we've left your property, don't hesitate to let us know. We'll resolve the situation at our own expense. Contact our flooring specialists to find out more about your options for tile flooring. We serve shoppers in Belmont, NH, and the surrounding areas.